Acknowledgments: The author is indebted to Larry DeWitt, Susan Grad, Barbara Lingg, and David Timmons for their excellent and substantive comments and suggestions. The author also thanks reviewers in SSA's Office of Communications and Office of Legislation and Congressional Affairs. Bob Ball at his desk at SSA Headquarters, April 1962. With the death of Robert Myers Ball at age 93 on January 29, 2008, the Social Security program lost one of its most committed supporters. Social Security Commissioner Michael J. Astrue (2008) stated, "Bob Ball left an indelible mark on the Social Security program and the Agency in that he played a critical role in the establishment of Medicare. His commitment to Social Security was unequaled, and he will be remembered as a great leader." Ball's biographer, historian Edward D. Berkowitz (2001), described Ball as "the major non-Congressional player in the history of Social Security in the period between 1950 and the present." Bob Ball had a long and distinguished career with the Social Security Administration (SSA). In a 1973 interview, he said that he first became interested in the Social Security program in his senior year at Wesleyan University in 1935. "The thing that has appealed to me most about the program," he remarked, "is that it supplies a continuing income to groups who without it would be most susceptible to poverty, yet it does this through their own effort—the protection grows out of the work they do and contributions they make. I've always been glad I made the choice of career I did" (SSA 1973, 18). Ball's influence in the sphere of social insurance is perhaps partially explained by the longevity of his career; he continued to be active in the field as a prolific writer and accomplished speaker until the time of his death. Beyond sheer longevity, his effectiveness in shaping social insurance policy is largely attributable to the fact that he excelled in three roles: as a social policy expert, as an inspiring leader and administrator, and as a master negotiator and legislative tactician. Bob Ball was very influential in shaping Social Security policy, both during his tenure at SSA and afterward. Throughout his long involvement in setting policy, he was guided consistently by the philosophy that a successful social insurance program must provide an adequate level of benefits, have near universal coverage, and maintain benefit rates related to the level of an individual's earnings so that payments are an earned, not just a statutory, right. He was also careful to say that Social Security alone was insufficient for an individual's economic security and that private pensions and savings are required (Ball 1973, 5). He was a consistent supporter of these "essentials" but flexible on the means of getting there. For example, while he supported a benefit computation formula weighted in favor of low earners, he recognized that "it is important to retain the support of higher-paid workers for Social Security, and it is a matter of delicate balance to determine just how far it is wise to go in pursuing income redistribution through this program. It seems to me that we now have it about right" (Ball and Bethell 1998, 15). Robert Ball was born in Manhattan on March 28, 1914. He graduated from Wesleyan University with a degree in English in 1935 and a master's degree in labor economics in 1936. In the summer of 1937, he took a job as assistant editor of the People's Press, a New Jersey labor newspaper. His early experience with the labor movement later influenced his support of union representation at SSA. In January 1939, just 4 years after President Franklin D. Roosevelt signed the Social Security Act, Bob Ball joined the Social Security Board's Bureau of Old-Age Insurance (precursor of the Social Security Administration) as a field assistant in the Newark, New Jersey field office, and afterwards served as manager of the Bayonne, New Jersey District Office. In 1942, he moved to the Bureau's headquarters in Baltimore, Maryland, becoming the Bureau of Old-Age and Survivors Insurance's chief staff expert on expanding coverage in its Division of Program Analysis. He subsequently served in the training office. Ball left the Agency from 1945 to 1949. During this period, he served as Assistant Director of the American Council on Education's Committee on Education and Social Security. This organization set up training classes on social insurance policy for think tanks, university professors, and government policymakers. With the nation focused on World War II, little attention was paid to the Social Security program in the years following the 1939 amendments, which extended benefits to family members of insured workers. The 1940s saw no general increase in benefits, and consequently, as the nation's overall standard of living rose, the adequacy level of benefits lagged far behind. Some prominent individuals suggested scrapping the Old-Age and Survivors Insurance program for a flat benefit paid out of general revenues, arguing that Social Security benefits were both too small and limited in coverage.1 A few of these proposals gained the attention of Congress. In July 1947, a Senate resolution authorized its Committee on Finance to appoint an advisory board to investigate the Old-Age and Survivors Insurance program and all other aspects of the Social Security program.2 The 1948–1949 Advisory Council on Social Security wanted someone not part of the Social Security Administration to be staff director, and it selected Robert Ball (Berkowitz 2003, 61). Ball wrote a key report greatly influencing the Advisory Council's recommendation to raise benefits and expand coverage. President Harry S. Truman supported the Advisory Council's recommendations, and the proposals were incorporated into the watershed 1950 amendments that significantly expanded coverage and benefits and provided for an average benefit increase of about 77 percent. The 1950 amendments settled the controversy in favor of Social Security and rescued the program from competition with noncontributory welfare programs (Berkowitz 2003, 19). The authors of a 1963 book entitled Adventures in Public Service remarked that Ball's work as staff director for the 1949 Advisory Council on Social Security "was the best thing that could have happened for American social security" (SSA 1973, 19). Ball returned to the Bureau of Old-Age and Survivors Insurance in 1949 as the Assistant Director of the Analysis Division. At that time, Congressional committees had little staff and depended on executive branch agencies for staff work, providing Ball the opportunity to influence legislation from his position at Social Security. In the spring of 1952, he suggested to the clerk of the House Ways and Means Committee that the rise in U.S. wages gave Congress an opportunity to raise Social Security benefits without raising the contribution rate. Largely as a result of this advice, the 1952 Amendments to the Social Security Act included a 12.5-percent benefit increase (Berkowitz 2003, 82). Ball served as Acting Director of the Bureau of Old-Age and Survivors Insurance from May 1953 to February 1954 and then became the Deputy Bureau Director. In these positions, he effectively served as both the Bureau's chief operating officer and as its legislative strategist. In 1954, he once again managed to convince both Democrats in Congress and Republicans in the White House that Social Security benefits should keep pace with the expanding economy, increasing benefits by about 13 percent and expanding coverage of additional occupations. Ball was especially influential in the decision to include farm laborers in the 1954 amendments (Berkowitz 2003, 8–9, 93–94). Ball helped draft the legislation establishing Social Security disability benefits in 1956 and was able to negotiate its passage even with the opposition of the Eisenhower administration. While Ball credits Wilbur Cohen as the individual who finally made the Medicare legislation happen in 1965, in 1957 Ball helped to prepare a bill for Congressman Aime Forand (D–RI) that was the forerunner of Medicare (Berkowitz 2003, 126). In addition to increases in cash benefits, Forand's plan would have provided payment for some surgical services and up to 120 days in a 12-month period of combined hospital and associated skilled nursing-home care, with not more than 60 days of hospital service, for individuals eligible for Old-Age or Survivors benefits (they need not actually be receiving benefits). These additional cash and health insurance benefits were to be funded by increased Social Security taxes of one-half percent each for employees and employers and three-quarters percent for the self-employed (U.S. House 1957, HR 9467).3 Although the bill did not pass, Ball continued to advocate Congress for health insurance from that time until Medicare's passage in 1965 and beyond. In July 1962, Robert Myers Ball was sworn in as Commissioner of Social Security. He served in this position under three U.S. Presidents: John F. Kennedy, Lyndon B. Johnson, and Richard M. Nixon. His tenure as Commissioner saw major changes in the Social Security program, especially the development of both the Disability Insurance program and Medicare. Ball also contributed to shaping the 1972 law providing for automatic cost-of-living adjustments effective in 1975. In addition, the architecture of the Supplemental Security Income (SSI) program (the federal program for the aged, blind, and disabled with limited income and resources) was developed when Senator Russell Long of Louisiana asked Ball to come up with ideas for public assistance for the needy elderly (Berkowitz 2003, 208). Robert Ball retired from SSA on March 17, 1973, but his involvement with the Social Security program did not end with his retirement; he continued as a prolific and influential writer, lecturer, and consultant on both social and health insurance policy.4 In 1974, he served as the Democratic Party's chief strategist on the program, working with Senator Edward Kennedy (D–MA) and Representative Wilbur Mills (D–AR) on health insurance legislation that would have provided for universal national health insurance (Berkowitz 2003, 214, 223–232). At the time of his retirement, Ball thought the Social Security program was in good shape and that further expansion was unlikely (SSI legislation had been passed but was still to be implemented). He thought that the future's greatest social insurance need would be national health insurance. So he joined the Institute of Medicine, a component of the National Academy of Sciences, as a scholar in residence on April 1, 1973, serving as a visiting scholar until 1980. In this position, he helped shape the Carter administration's 1977 Social Security proposals that improved the program's financing and revised the way benefits were computed (Berkowitz 2003, 221, 244–252). In 1981 and 1982 Ball served on the National Commission on Social Security Reform, better known as the Greenspan Commission, representing House Speaker Tip O'Neill (D–MA) in negotiations with the White House. This bipartisan Commission's recommendations resulted in the 1983 Amendments to the Social Security Act—the last major piece of Social Security legislation in the 20th century. President Ronald Reagan set up the Commission because the Social Security Trust Funds were in danger of depletion; high inflation and unemployment were decreasing revenues. The Commission was deadlocked until Ball initiated behind-the-scenes negotiations with Reagan's chief of staff, James A. Baker III, and Deputy Treasury Secretary Richard G. Darman. Together, they came up with a compromise including a balance of tax increases and benefit cuts that was acceptable to both Reagan and O'Neill (Bethell 2005). Almost no one in the United States outside the Washington Beltway has ever heard of Robert M. Ball.…But for the last 15 to 20 years, Ball, whose formidable mind and powerful negotiating abilities belie his 72 years, has been probably the nation's most influential Democrat—and possibly the most influential person of any party—in shaping the fate of the giant Social Security program. In 1986, Ball founded the National Academy of Social Insurance, a nonpartisan, nonprofit organization that promotes research, education, and informed policymaking on social insurance. He also served on the Board of the Pension Rights Center from 1984 until 2004. From 1994 to 1996 Ball was a member of a Social Security Advisory Council that was charged with solving the problem of long-term financing. During its deliberations, the Council split into three camps with competing proposals. The Council chairman, Edward M. Gramlich, a Federal Reserve board member, favored the creation of what he called publicly held individual accounts. A second group, led by Sylvester Schieber, the vice president of a private pension consulting company, favored a plan for partial privatization of the system, a precursor to the broader plan that President George W. Bush would propose 8 years later. Ball formed a coalition that favored modifying aspects of the traditional Social Security program but also included investing part of the Trust Fund in private equities. To Ball's disappointment, Gramlich did not push for a Council consensus, but put forth all the major alternatives (Berkowitz 2003, 343–351). Because of changes since 1983 in some of the assumptions governing their long-range projections, Social Security's trustees now anticipate a deficit over the current 75‑year estimating period of about 2 percent of payroll. It is this long-term shortfall—not trivial but not remotely synonymous with 'going broke' —that must be addressed" (Ball 2007b). He adamantly opposed cutting benefits, and indeed suggested benefits should be increased given that only 20 percent of the workforce had traditional pension guarantees, the vagaries of the 401(k) investments that had replaced the traditional pension scheme, the extremely low savings rate among Americans, and the dependence of the majority of the elderly and the disabled on Social Security benefits as a major part of their income. Social Security benefits are modest by any measure and are already being cut—by raising the age of eligibility for full benefits and by deducting ever-rising Medicare premiums from benefit checks. So the benefits provided for under present law will replace, on average, a lower percentage of prior earnings than in the past. To cut them further would undermine all that Social Security has achieved—exposing millions of vulnerable people, both elderly and disabled, to needless economic hardship (Ball, 2007a). Ball developed a number of proposals for ensuring the long-term solvency of the Social Security program. Illustrating his continued involvement in the social insurance sphere, in 2007 he proposed a three-step solution to the solvency problem: (1) restoring the practice of collecting the Social Security tax on 90 percent of earnings in covered employment by gradually increasing the maximum taxable earnings base, (2) changing the estate tax into a dedicated Social Security tax beginning in 2010 and, (3) investing a portion of Social Security's assets in stocks. This proposed solution would be strengthened with a contingency contribution-rate increase to go into effect if the Trustees were at some point to project that the trust funds would begin to decline within the next 5 years. Ball explained that the contingency was needed because of the uncertainty of any long-range estimates and by the undesirability of over financing (Ball, 2007b). The weighted Social Security benefit formula favoring the low-paid, which has been so successful in reducing poverty and near-poverty among the elderly, is not likely to be maintained in a system made up largely of individual accounts. On the other hand, a parallel government system of flat benefits high enough to make a major impact on poverty is likely to be means tested, regardless of the specifications proposed by sponsors (Ball and Bethell 1998, 46). Ball was one of those rare individuals who possessed remarkable skills not only as a policy analyst but also as an administrator and leader. Social Security employees and managers who served under Ball remember him as a highly principled man who garnered their deep respect. He was known as a superb administrator with a management style that pushed decisionmaking down the organizational chain. Congressman Wilbur D. Mills, chairman of the House Ways and Means Committee from 1958 to 1975, described Ball as "a near genius in administration," and former Health, Education, and Welfare (HEW) Secretary Wilbur J. Cohen told a reporter in 1966 that he thought of Mr. Ball as early as the 1940s as "a simply superb administrator" (SSA 1973, 20). [The "Statement of Bureau Goals and Objectives"] anticipated by many years the vogue for mission statements that would become a clichéd aspect of life in any large organization, the need to orient a government organization toward the service of its customer, rather than the mere fulfillment of inner bureaucratic needs, and the goal of making employees feel like valued members of the organization (Berkowitz 2003, 102). Let us, as we work, remember that each is a part in the whole effort, and that the job cannot be done without the help of each, whether you are a punchcard operator in the Bureau of Data Processing and Accounts, or whether your job is in the files, whether you have the responsibility to supervise others or to perform a journeyman's job, whether you write procedure or carry it out. Each job is essential and it is essential because it is needed to serve the American people, particularly the elderly people, the widows and orphans, and the disabled of the country (Ball 1965). 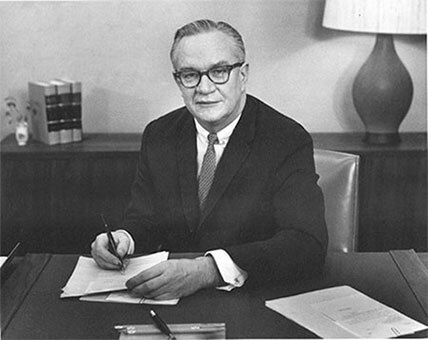 Early in 1957, Marion Folsom, Secretary of HEW from 1955 to 1958, appointed a group of executives from large, well-regarded companies to review the technological and procedural aspects of the Bureau's operations. The resulting report (which Ball admits to having helped write) made very few recommendations, extolling the Bureau for its pioneering use of automatic machinery to handle paperwork and praising the courtesy and efficiency of its employees (HEW 1958). Ball's skills as an administrator also were amply demonstrated in SSA's implementation of the Medicare program. President Johnson signed the Medicare legislation on July 30, 1965, with an effective date of July 1, 1966, which gave the Agency less than a year to implement the program, a tremendous undertaking. However, Ball did not wait until the bill was signed to gear up the Agency; on the Presidential plane on the way to the signing ceremony, Ball distributed a pamphlet already developed to explain the Medicare program to the public. Other public relations material that was ready on day one included television and radio spots, newspaper articles, and speeches to a wide range of organizations. The amount of activity required to implement the Medicare legislation, while simultaneously implementing the Social Security benefit pieces of the 1965 legislation, was staggering. First, it required identifying and contacting 19 million potential beneficiaries and determining their eligibility. SSA employees had to obtain enrollment forms from those wanting the Supplementary Medical Insurance (SMI). The Agency also had to ready and certify the providers of service under the Hospital Insurance program and work with the medical service providers (for example, physicians and providers of durable medical equipment) that would be covered under SMI. It had to develop contracts with intermediaries that would handle reimbursement for hospital services rendered and with the carriers that would determine "reasonable charges" for services and handle the reimbursement for physician services and durable medical equipment. Another necessity was creating the administrative infrastructure needed to administer the Medicare program, including hiring and training 9,000 employees, setting up 100 field offices, coordinating activities with numerous other federal agencies, and developing internal systems capacity. In addition, SSA had to develop extensive Medicare program policy through consultations with other agencies and many interest groups (Ball 1965 and Gluck and Reno, iv–v). Ball later attributed the Agency's success in implementing Medicare to three factors: an existing nationwide organization experienced with dealing with the public that was disciplined, with high morale, and eager to do the job; a group of central planners and leaders with enthusiasm, imagination, and quality leadership skills; and an almost complete delegation of authority and responsibility to SSA from higher levels (Gluck and Reno, 9–10). What a great time this really is to be alive. We are on the edge of greatness in America. We are taking steps to improve the position of the poor; the security of the old, the disabled, widows and orphans; the education of the young; and freedom and equality for all. And what a great time to work for Social Security and be a part of this program which is doing SO much for so many! We all have a great opportunity, and a great trust to perform; let's get on with the job (SSA 1965, 28). Perhaps because of his early work for a labor publication, Ball was an advocate of unions. He believed that a responsible union could provide information to management on things that were going on that upper management, in particular, would otherwise never hear. Ball signed the first union contract into which the Agency entered. After that of the Post Office Department, it was the first government labor contract of comparable size (SSA 2001, oral history Ball #2). Ball was also proactive in the area of civil rights. In August 1963, he established an advisory council to make recommendations for affirmative action and implemented its 17 recommendations. He started an onsite training program at SSA's central office to enable employees to get their high school equivalent or college degrees so that employees in lower grades could meet minimal requirements for promotions. His wife, Doris, headed a community housing project to address housing discrimination that caused problems for minorities detailed to Baltimore. He also ensured that medical facilities met the requirements of Title VI of the Civil Rights Act of 1964 before being granted Medicare certification (SSA 2001, oral history Ball #2). Robert Ball's administrative and leadership skills were recognized in his receipt of several awards. The 1958 Career Service Award of the National Civil Service League cited his "notable ability to lead and inspire those who work with him." The citation on the Arthur J. Altmeyer Award he received in 1968 reads: "His Leadership, Dedication, and Administrative Ability Have Brought Hope and Dignity to Millions of Americans." Ball was also the first person to receive the Rockefeller Public Service Award for "distinguished service in the field of administration" awarded by the trustees of Princeton University (SSA 1973, 19). There are many who propound policy theories, but few possess the skills to make those theories the law of the land. Ball was one of those few. Ball was known as a clear and articulate communicator and a master at working with Congress. He could be persuasive even while maintaining a very low-profile demeanor at meetings with government officials. His extensive knowledge of the Social Security program, his thorough preparation before meetings, his willingness to make necessary compromises, and his personal affability gave him extensive influence with policymakers. He had a real talent for advocacy in such a clear manner that his proposals seemed very reasonable and practical. His biographer observed that he came across as someone who wanted to solve a practical problem rather than as an ideologue (Berkowitz 2003, 17). Ball was particularly effective in using the concept of Social Security as "earned benefits" to assuage conservative concerns about expanding the program. We have some appreciation now.…of what a tremendous task the Congress had imposed on you and the diligence and intelligence with which your Bureau and its officials have gone about in trying to carry it out.…On the whole, the program has been administered very fairly and with great capacity by excellent public officials. We are particularly grateful to Mr. Ball, who has demonstrated his great capacity and his dedication to performance of these services with his great ability. (SSA 1973, 20). Ball cultivated the friendship of elected officials so that they would at least be open to considering his views—even going so far as hiking and camping with Senator Harry Byrd, Sr. (D–VA), a member of the Joint Committee on Internal Revenue Taxation, to try to overcome his opposition to Medicare (SSA 2001, oral history Ball #3). In the 1970 debates over benefit increase and automatic cost-of-living increases, Ball, ostensibly a member of the Republican executive branch, was included in the Democrat-controlled Senate Finance Committee closed executive sessions—and had the trust of both the committee and his superiors at HEW (Berkowitz 2003, 186). He managed to be an ally of both Republican Elliot Richardson at HEW and Democrat Wilbur Mills in Congress simultaneously. John Veneman, Under Secretary for HEW from 1969 to 1973, said of Ball, "He is like a magician. Just at the time you are at a critical point, he comes up with a solution" (Berkowitz 2003, 200). As Bob Ball's role in the 1983 Greenspan Commission proved, he had a talent for finding acceptable compromises. Ball's operating philosophy was that "the good result is achieved by a combination of things to each of which there is some objection" (SSA 2001, oral history Ball #6). To break the impasse at the Greenspan Commission, Ball offered Reagan and the Republicans things that he personally did not endorse—a permanent 6-month postponement in the cost-of-living increase, increased delayed retirement credits, and an increase in the full retirement age—as he realized it was necessary to give Reagan and the Republicans something. He also supported other provisions that were counterintuitive to "liberal" causes—the taxation of benefits and the inclusion of federal employees under Social Security (SSA 2001, oral history Ball #5). Inherent in this assignment is the responsibility to continually define the social security program through (a) recommendations for changes in the programs themselves, (b) policy interpretation of the existing laws, (c) the setting and modification of standards of service, (d) the interpretation and explanation to the public of the philosophy and meaning of the programs, and (e) modifications in the administering institution—its methods, personnel, organizational structure, physical plant, and system of values (Ball 1973, 1). As head of the Social Security Administration, Ball managed to perform all of these tasks successfully. He excelled as an administrator managing the Social Security program and was highly effective not only in formulating policy but also in the negotiation skills required to translate the proposed policy into law. Ball's influence extended beyond his tenure with SSA. In his establishment of the National Academy of Social Insurance, his work with the Board of the Pension Rights Center, his time with the Institute of Medicine, his participation in a number of Social Security advisory councils, and his role as a consultant to presidents and members of Congress, Ball continued to be influential up until the time of his death. In addition, AARP Policy Director John Rother (AARP 2008) speculated that Bob Ball would have a lasting effect on the debate for broader health and pension coverage for years to come via his many writings and his inspiration of younger advocates and leaders in the social insurance field. The policy issues Robert M. Ball laid out in his final report to SSA as Commissioner are still issues with which policymakers are grappling: making the Social Security program easier to understand and to administer, reducing the reporting burden on employers, financing health insurance programs, achieving program equity for women and other groups, managing the disability program, and determining the optimum earnings replacement rate (Ball 1973). The nation will miss having Bob Ball's thoughtful, informed, and creative views as we continue to seek solutions to these challenges. 1 One prominent example of early flat-benefit schemes was the Townsend Plan, a 1933 proposal by Dr. Francis E. Townsend. See http://www.socialsecurity.gov/history/towns5.html for additional information about this proposal. 2 At this time, the Social Security Administration was responsible not only for Old-Age and Survivors Insurance, but also for the federal/state public assistance, child welfare, and unemployment compensation programs. In December 1962, unemployment compensation, public assistance, and child welfare were removed from the jurisdiction of the Social Security Administration and brought together in a new Welfare Administration Agency in the Department of Health, Education, and Welfare. 3 A Time Magazine (1960) article attributed a one-quarter percent increase in taxes each for employees and employers to the cost of the health benefit provisions. However, the author could not verify this in the Congressional Record for HR 9467. AARP Press Center. 2008. AARP saddened by the loss of Robert M. Ball. January 30. Available at http://www.aarp.org/research/press-center/presscurrentnews/aarp_saddened_by_the_loss_of_robert_m_ball.html. Astrue, Michael J. 2008. Death of Robert M. Ball. An email message to all SSA and DDS employees. Available internally at SSA only at http://eis.ba.ssa.gov/eis/online/commish/2008/b01302008.htm. Ball, Robert M. 1965. A report on the implementation of the 1965 Amendments to the Social Security Act. Available at http://www.socialsecurity.gov/history/medreport.html. ————. 1973. Managing the Social Security program. Available at http://www.socialsecurity.gov/history/pdf/ballpart1.pdf. ————. 2000. Insuring the essentials: Bob Ball on Social Security. Ed. Thomas N. Bethell. New York: The Century Foundation Press. ————. 2007a. A Social Security fix for 2008. The Washington Post. October 29, A15. Available at http://www.robertmball.org/. ————. 2007b. Meeting Social Security's long-range shortfall: A golden opportunity for the new Congress. April. Available at http://www.robertmball.org/index04052007.htm. Ball, Robert M., and Thomas N. Bethell. 1998. Straight talk about Social Security: an analysis of the issues in the current debate. New York: The Century Foundation Press. Berkowitz, Edward D. 2001. Bob Ball and Social Security. Available at http://www.robertmball.org. ————. 2003. Robert Ball and the politics of Social Security. Madison, Wisconsin: University of Wisconsin Press. Bethell, Thomas N. 2005. Roosevelt redux: Robert M. Ball and the battle for Social Security. American Scholar 74.2 (Spring): 18, and continued in 74.3 (Summer): 60. Gluck, M.G., and Reno, V., eds. 2001. Reflections on implementing Medicare. Washington, DC: National Academy of Social Insurance. Available at http://www.nasi.org/usr_doc/med_report_reflections.pdf. Rich, Spencer. 1986. Robert M. Ball: Democrats' outsider insider on Social Security issues. Washington Post. November 17. A11. Available at http://proquest.umi.com/pqdweb?index=16&did=123287562&SrchMode=1&sid=9&Fmt=12&VInst=PROD&VType=PQD&RQT=309&VName=HNP&TS=1220533817&clientId=3621. [SSA] Social Security Administration. 1965. Social Security Act: 30 years of building. OASIS (11)8: 24–28 (August). Available at http://www.socialsecurity.gov/history/oasis/august1965.pdf. ————. 1973. Ball ending 30 years of service with Social Security. OASIS 19(2): 18–21 (February). Available at http://www.socialsecurity.gov/history/balloasis.html. ————. 2001. Oral history collections: Robert Ball. Interviews by Larry DeWitt. Available at http://www.socialsecurity.gov/history/orals/balloralhistory.html. ————. n.d. SSA History: History of SSA during the Johnson administration 1963–1968. Available at http://www.socialsecurity.gov/history/ssa/lbjperson1.html. Time Magazine. 1960. Pain, pressure & politics make powerful medicine. May 09. Available at http://www.time.com/time/magazine/article/0,9171,897447-2,00.html. U.S. Congress. House. 1957. Social Security Amendments of 1958. HR 9467. 85th Cong., 1st sess. As recorded in DHEW. SSA. Background on Medicare 1957–1962: Reports, studies and congressional considerations on health legislation. Volume 1. Available internally at SSA only at \\s078a41\LegislativeHistories\Other Legislative Materials\Background on Medicare-1957-62 Vol 1.pdf.